Wrench’s Facts: Get Inspired to take the Top Spot! 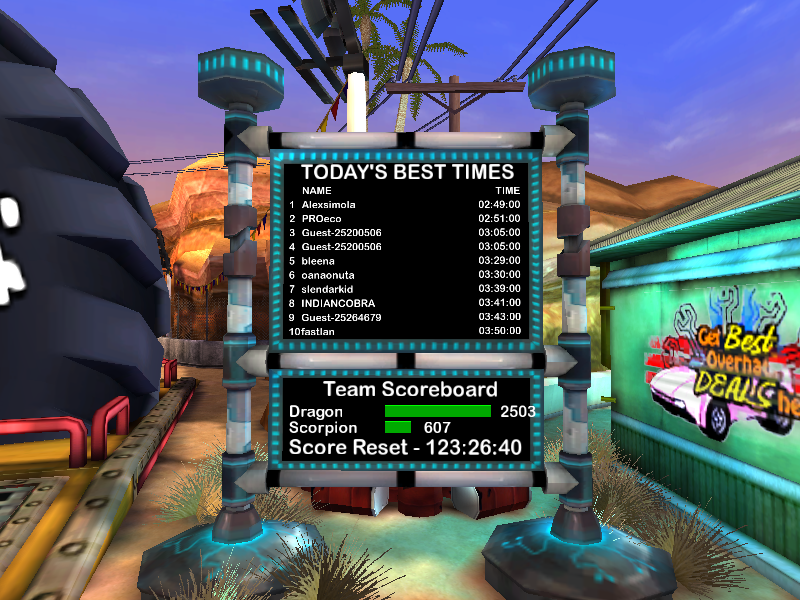 Around Eat My Dust we have our leaderboards, which track not only team standing but also the achievements of individual racers. Have you or any of your racing buddies ever made it to the top spot? Taking an EMD record takes a combination of skill and mechanics. Upgrade your custom cool racing machine and learn a little more about some of the real world racers you might want to emulate behind the wheel. To help inspire you to be the first across the finish line in your next race, Wrench has compiled a list of a few NASCAR Hall of Fame inductees. Since its inaugural ceremony in 2010, here’s a quick list of drivers to follow on the track. Check it out and let us know about some of your favorite racers! Green Flag: This flag is waved at the start of a race and during re-starts. When the green flag is used, the first-place driver cannot be passed. Yellow Flag: The yellow flag cautions drivers to potential dangers on the track, signaling them to slow down to a predetermined speed. This flag is often used when there is debris on the track from a wreck. Red Flag: Just like a stop sign, the red flag notifies drivers to stop the race immediately. This flag is usually used for safety reasons, and drivers must stop no matter where they are on the track. 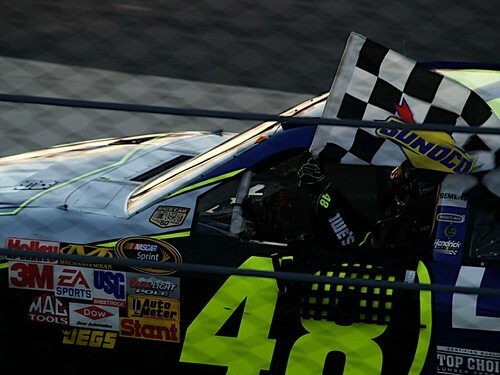 Black Flag: The black flag is shown to individual drivers that must respond to a concern from NASCAR. Some examples for receiving this flag are speeding on the pit road, dropping debris on the track, or failing to maintain the minimum track speed. Drivers have 5 laps to respond to the black flag. Black Flag with Diagonal White Stripe: A driver who fails to respond to the black flab by pitting within 5 laps is shown this flag. As a result, the driver’s score is suspended until further notice. Blue Flag with Diagonal Yellow Stripe: A courtesy flag shown to drivers not on the lead lap, it indicates that slower drivers should yield to faster drivers approaching them. White Flag: This flag waves when the lead driver begins the final lap. 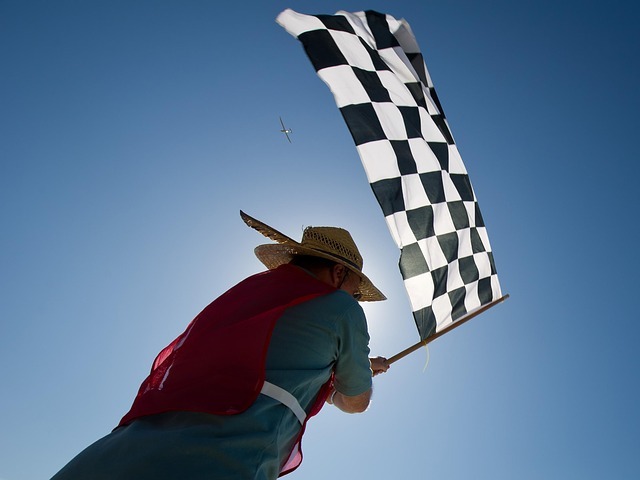 Checkered Flag: The most famous flag, this flag waves when the winner crosses the finish line. Now that you know all the flags involved in NASCAR, keep an eye out for them the next time you watch a race. Root for your favorite driver and see how often each flag appears during the competition. Have you ever wondered what the exterior components available in the mechanic shop actually are or what it is tat they do for your car? This week, Wrench’s facts give racers like you some insight about how these components can increase your chances to be the first across the finish line! This refers to the internal frameworks, which is often referred to as the “skeleton” of the vehicle. The other components, including the engine, transmission, suspension, and the body of the car are attached to this framework. It is a foundational structure that is essential to a vehicle. This feature is more about the style and physical aesthetic appeal of the car, rather than improving its functionality. A paint job allows the driver to customize their style, making it unique. It is a device that enables the swift movement of the entire vehicle. If you read the post about Off-Road tires from last week, you will understand why different wheels can help tame difficult situations you will face in the game. It directly affects the traction your car has with the ground surface, which ultimately changes how you handle your car. Very few drivers are born with the natural gift of driving and even the best knows the importance of practicing in order to keep their skills sharp. During your down time in between races, it is crucial to stay on top of your game by enhancing your strengths while improving upon your weaknesses. Luckily, there are two practice modes that can help you address whatever needs you have. Just as the name suggests, this type of practice pits you in a traditional race setting as you compete against others. Like races at the Racing Circuit, practice can be summed up in two rules: 1) leave your opponents behind in your dust and 2) dust or be dusted. As you work on your driving technique and learn the details of various tracks, you must also focus on dodging incoming fire while using your own weapons to clear the way to victory. In Time Attack, you get the entire racetrack to yourself as your only opponent is the clock. Speed to each checkpoint before time runs out and see a breakdown of each leg of the race along with your total time once you finish. 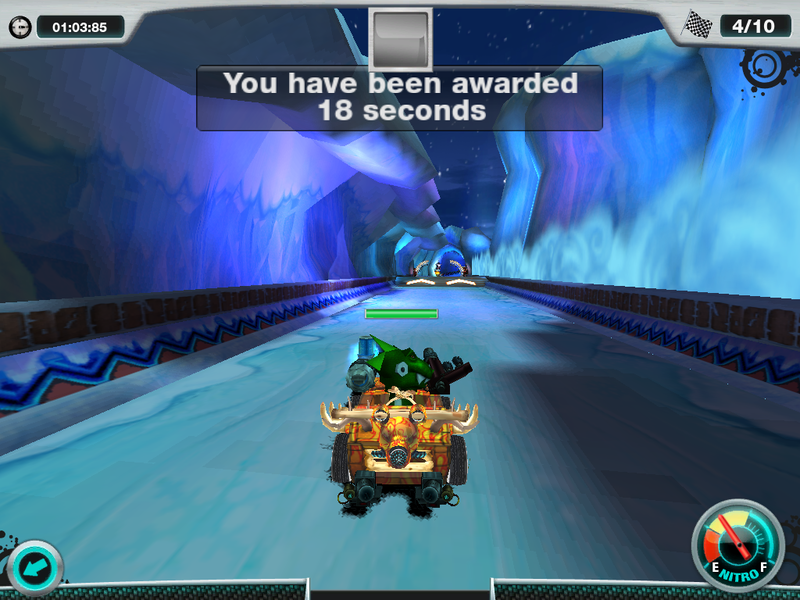 This mode is a great way to see which parts of the track you excel at while identifying others that need improvement. Use this opportunity to find shortcuts, speed boosts, and gain an unparalleled understanding of each track’s unique design. The combination of speed, handling, and knowledge that you attain from this mode will baffle your rivals as they watch you speed off into the distance. While some may view practice as a tedious activity, it takes on a whole new meaning in Eat My Dust. 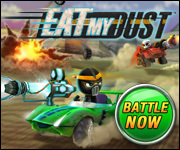 Rev your engine, dodge incoming fire, and race the clock to become the best driver around. Before long, your rivals will be trying to discover the secret to your success. The Temple of Pakhet is more than just an excavation site in one of Egypt’s most famed—and dangerous—pyramids. Having been abandoned for years by researchers due to the pyramid’s numerous booby traps, Pakhet’s treasures have remained untouched and its secrets undiscovered. It was only a matter of time before the Dragons and Scorpions heard whispers of Pakhet’s myth and raced to see who could claim the forgotten treasure first. However, the Dragons and Scorpions soon came to understand why the ruins had been abandoned. The roads weaved through towering monuments and statues, plunged deep into dark tunnels, and beckoned drivers to dodge one trap after another. 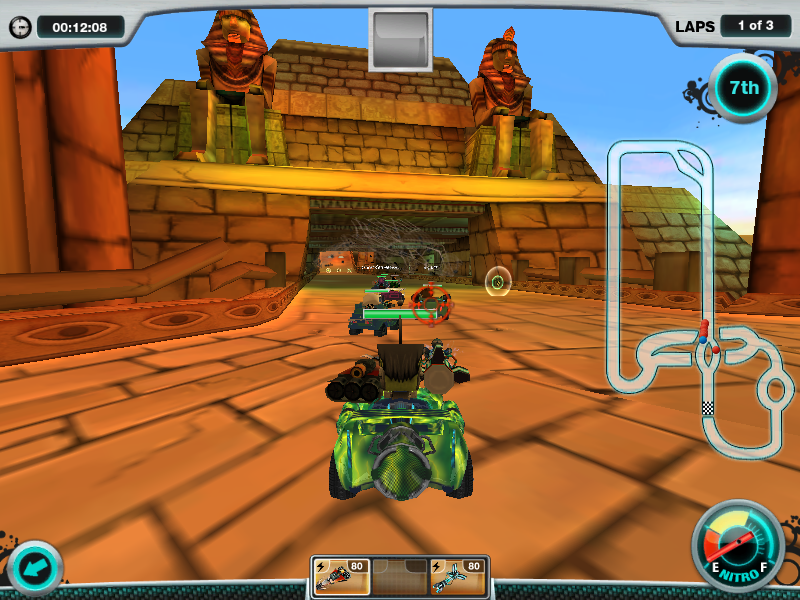 The temple’s roads proved to be difficult for even the crews’ best drivers. Intrigued by this find, the Dragons and Scorpions ended their search for the temple’s buried treasures as they had found something far more valuable than any amount of gold or gems. The teams had found the perfect training ground for new recruits. The Temple of Pakhet’s terrain boasts a number of qualities that cannot be found on any other racetrack. Each of these characteristics tests a driver’s abilities, whether it is speed, reaction, or endurance. First, numerous statues and objects jut from the sands. Drivers must be aware of the many obstacles that block their paths, especially when turning the raceway’s sharp corners. 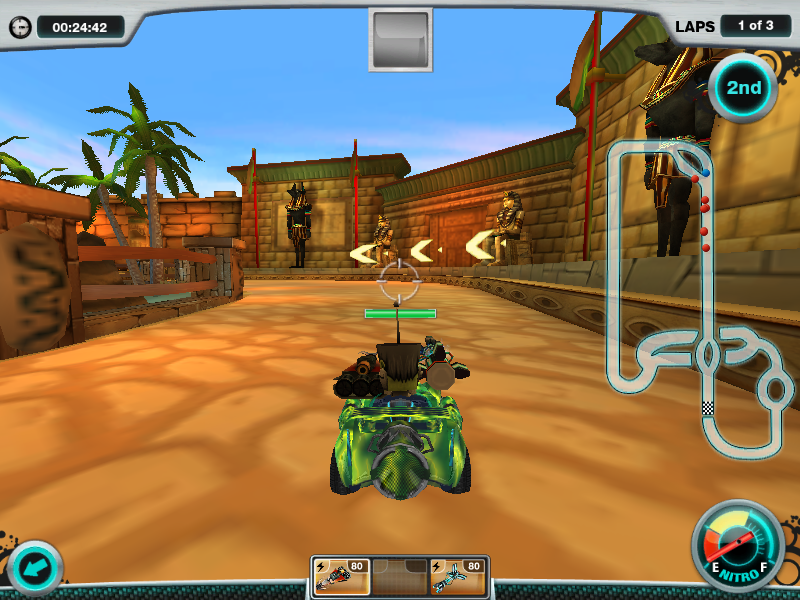 Second, racers must be aware of the speed boosts that can launch them to victory or to their demise. Drivers that are able to control this burst of speed will pull away from their rivals while unsuspecting racers will be thrown helplessly into danger. Finally, drivers have to keep their eyes peeled for hidden shortcuts. While inexperienced drivers will fly by these alternative routes, savvy racers will capitalize on these shortcuts and learn how to analyze tracks for the quickest paths to victory. The challenges the Temple of Pakhet present to drivers will hone and refine their skills. Novice drivers will gain the experience of hardened veterans while the best racers will advance to the ranks of the racing elite. 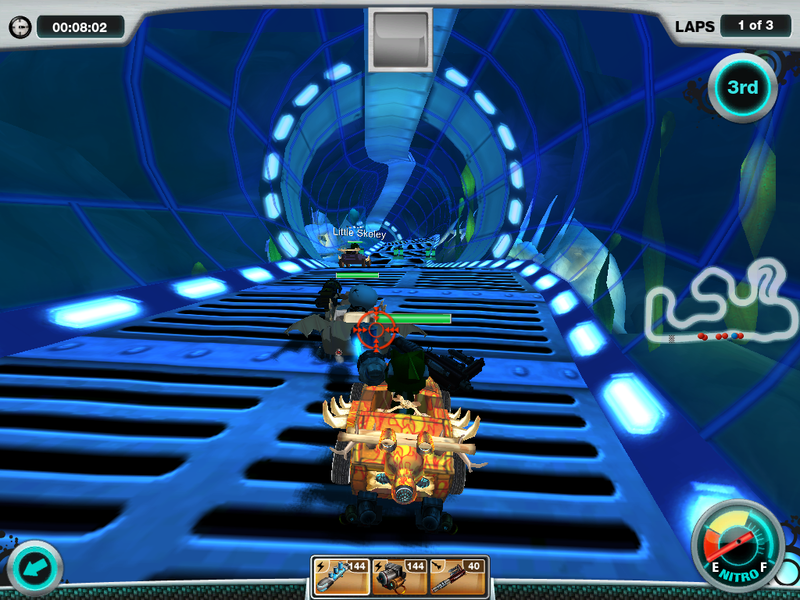 Try your hand at the Temple of Pakhet racetrack to see what treasures await you. While skill plays a major role in a racer’s success, every driver knows they cannot rely on a hunk of junk to win every time. A car is more than a piece of metal on wheels—it is an extension of the driver. The best racers put great effort into designing a car that meets every one of their needs. By understanding the various aspects of their car, a driver can dominate the circuit. 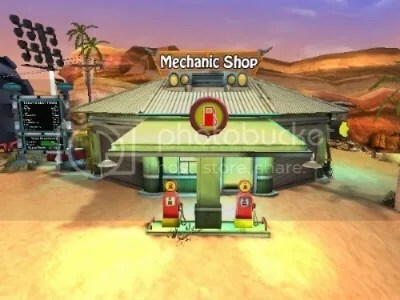 To begin working on your vehicle head to the Mechanic Shop. The first pieces of the puzzle lie in the car’s exterior. Choose the body kit that best embodies your racing style. Want to show your rivals that you are one tough driver? Try out a tank chassis. Are you a proud member of the Dragons whose skills are as hot as the creature you represent? Equip your car with a dragon’s head on the front end. Perhaps you want to instill fear in the hearts of the Scorpions’ foes? Add a scorpion tail to the rear of your car to show that you mean business. The Mechanic Shop has a ton of body kits, tires, and skins to choose from that best fit your style. Also, keep in mind that different parts affect your stats differently. Compare your choices to see which design best meets your needs in terms of function and appearance. When in a race between the Dragons and Scorpions, disputes are not simply settled when one crosses the finish line. The Racing Circuit is a battlefield and savvy drivers understand that their vehicles must possess a balance of speed and power. Much like choosing your car’s body kit, think about your driving style when selecting your weapons. Do you want big, in-your-face weapons like the lightning gun or plasma cannon? 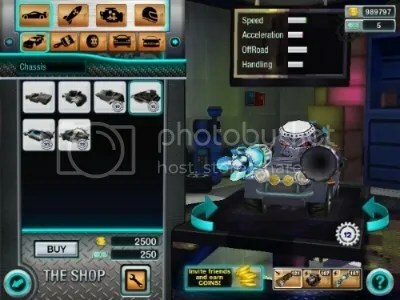 Or perhaps you like to build upon a huge lead with traps like the land mine launcher? Whatever your tastes, make sure to incorporate these into the final design of your car. A well-designed car will enhance your driving abilities. You will notice the difference when you enter the circuit and decimate your rivals—leaving them in your dust. However, first you must do some research on the best body kits and weapons that fit your style. Start thinking about the message you want to send to other racers and begin building! The battle for dominance rages on between the Dragons and Scorpions—which side are you on? While drivers on either side debate about whose team is better, there is one way to decide which force is truly number one: the Team Scoreboard. 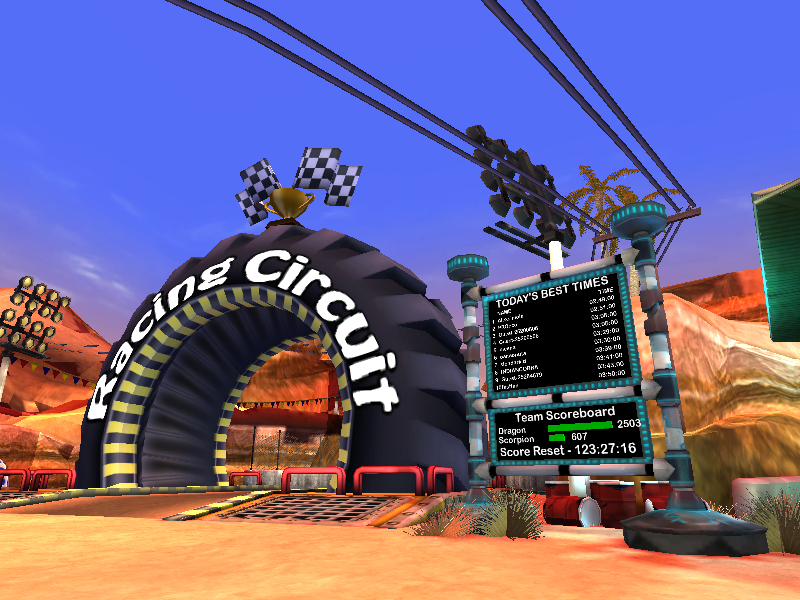 Check the Team Scoreboard located next to the Racing Circuit’s entrance before each race to determine how much of a lead your team possesses or the amount of ground you need to make up to even the playing field. 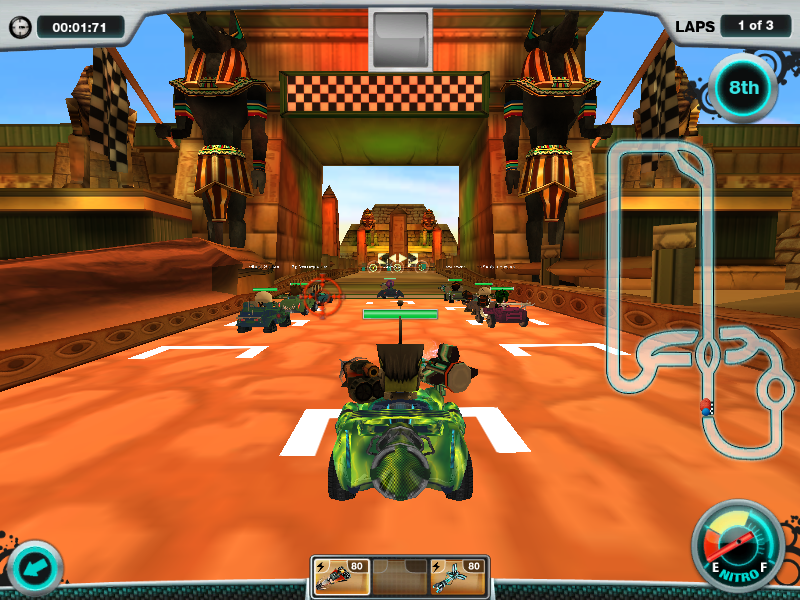 The scoreboard takes a number of factors into consideration such as drivers’ racing times, place finishes, and the number of enemies dusted. It takes a well-rounded team to be number one and getting your team into a winning position is as much a team effort as it is an individual accomplishment. Your rivals may disagree with you on which team is better but ultimately, talk is cheap. Round up your crew and let your driving do the talking. At the end of a hard day’s work, you will be able to point to the Team Scoreboard to silence your critics and prove once-and-for-all which team owns the streets.